The circulating collection comprises more than 4 Million individual volumes. As an undergrad, you can borrow an unlimited amount of books for a period of 28 days, to be renewed up to 3 times in person or online. Our website is the main search engine for the catalog and can be used to expand or restrict your search for materials. 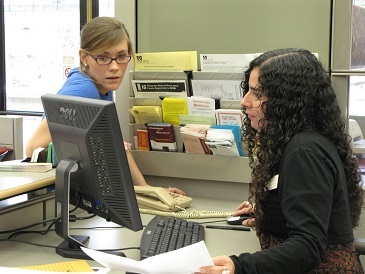 If you need help finding research materials, meet with the librarian assigned to your major to learn about what we have to offer and where you should start looking. If you ever have trouble finding a specific book, check in with student workers at the Ask Us! Area on the Lower Level of Du Bois or at the Service Desk in the Science and Engineering Library on the 2nd floor and they can help. UMass students also have access to some of the physical items from the Amherst, Smith, Hampshire, and Mount Holyoke College Libraries. You also have access to the Commonwealth Catalog that covers many more Massachusetts public town libraries. "CommCat" is great for getting popular reading material, DVDs, and more. Additionally, UMass students have access to Interlibrary Loans, a program which connects us to countless institutions around the world-expanding our lending options into the tens of millions. When you include all of the other items that the library holds, the collection reaches over 9 Million individual items. Students have access to CDs, DVDs, VHSs, LPs, microforms, AV and electronic equipment, and more, all for free for students as long as you have a valid UMass Amherst UCard. As a research institution we also have subscriptions to numerous periodicals and academic publications. Most are now electronic but the old issues of print materials can be taken directly from the shelf for short term borrowing. Check out our list of Databases to learn more about individual resources or to start your research! The Libraries have access to hundreds of online materials, and more than 500 databases that can expand your scholarly horizons and give you direct interaction with materials relevant to your field of study. Through our subject guides you can search for your specific major and view ways to get in contact with your Librarian and see all of the most important online resources for your research experience. If you would like to meet with a librarian to explore the databases or learn how you should be researching, schedule an appointment or stop by the Ask Us! Area on the lower level of the Du Bois Library or at the Service Desk in the Science and Engineering Library to speak with one of our reference staff. Every service desk in the building is covered by professional and student staff who can answer almost any question you could ask, or can refer you to whoever can. The main desks are on the entrance floor and lower level of the Du Bois Library, or on the 2nd floor of the Science and Engineering Library. If you ever need to speak with a specific department, check out their page on our website to see their hours and contact info. For specific employees, search them through the search feature on our website.